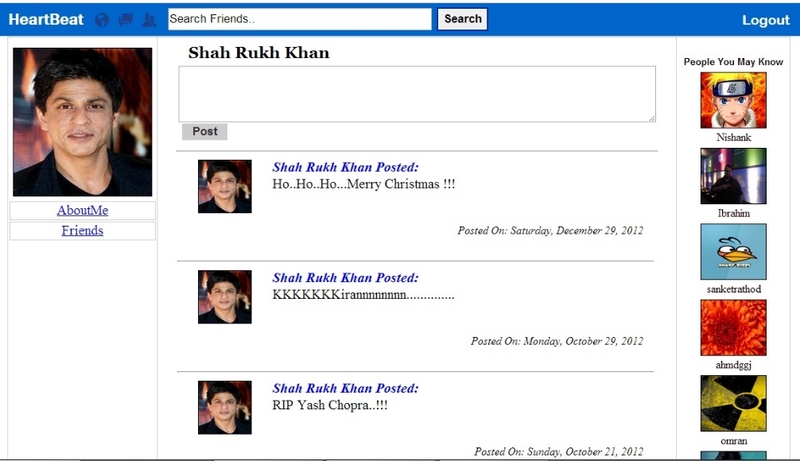 Friend Requests are a very important part of any social networking website. To Receive the Friend requests we have created a user control.In this user control we have shown the username ,photo along with accept and reject button. Open FriendRequests.ascx User Control Which You have created in Controls Folder. In the Source of FriendRequests.ascx user control you can add the following piece of code given below. In FriendRequests user control we have created a tabular structure and in that tabular structure we have dragged dropped one datalist and two link buttons for accept and reject. Datalists Itemtemplate contains the user profile picture and also the username. As always we are binding the image to profile picture using image handler. We have also binded the RegisterId to Accept and Reject Button in the form of command argument so that we can update the frienship status properly when the user clicks accept or reject button. <%@ Control Language="C#" AutoEventWireup="true" CodeFile="FriendRequests.ascx.cs"
<asp:ImageButton ID="imgbtnYou" runat="server" BorderColor="#CCCCCC" BorderStyle="Ridge"
<asp:Button ID="Reject" runat="server" ToolTip="Reject" Text="Reject" Width="59px"
Now Open the Code behind file of Friends User Control. In FriendRequests.ascx.cs file you can add the following piece of code given below. In code behind from page load method we are calling a function ShowFriendRequests(). This function will check for friends requests from database and if there is a friend rquests it will bind it to the friendlist datalist. We have added a userid equals currentprofileid so that we only see ours friend requests and not others friend requests. To get the friend requests we have made a sub query between register table and friends table and checking the friendship status as zero.while checking the friend requests if the user clicks on the profile picture of the friendrequests then we are diverting it to his her profile. We also have two Button Click Events Accept and Reject.On Accept we are updating the friendship status with one and On Reject we are updating the friendship status with two. To get the friendId we have made use of Command Argument so that we can update the friendship status for particular user only. Once the FriendRequests.ascx user control is ready we have to add it to Search.aspx page as shown below code snippet. <%@ Page Title="" Language="C#" MasterPageFile="~/ProfileMaster.master"
<asp:Label ID="Label1" runat="server" Text="Your Friends Your HeartBeats"